Eldorado Canyon features over five hundred routes with trad, sport, and top rope routes. Known for its gold and red cliffs, this place is a trad climber's haven. It's only 7 miles from Boulder, which makes it very accessible. And there are a lifetime's worth of climbs. Bastille Crack (5.7+) is one particularly classic climb, but can be crowded especially on summer weekends. Bouldering is also popular in Eldo Canyon with many problems not named. The park can get very hot in the summer. North facing climbs will offer the most shade. Eldorado is a classic destination that is entrenched in America's climbing lore. Epic sandstone walls reach over 700 feet from the ground and the trad climbing is an excellent benchmark of a leader's ability. Unlike Boulder Canyon, where the grades can be a little soft, Eldorado Canyon was developed at a time when 5.10 really meant something. It's not unusual for experienced climbers to be humbled by the puzzling technical climbing and creativity needed to excel on the rock. Eldo really requires a full bag of tricks. Many climbs utilize counter-intuitive face moves and run out traverses. Even the low grade classics like Wind Ridge (5.6+) and Bastille Crack (5.7) are not as easy as their grades suggest. Over the Hill (10.c) and Rosy Crucifixion (10.a) are excellent intermediate routes, while the fabled Naked Edge (11.b) may be the most famous expert climb, featuring hard moves on run out, sketchy gear, not to mention pucker-worthy exposure. All that said, if you're the type of climber who thrives on challenge — or a climber of any level who wants to up their game — Eldo is the place for you. You'll find a combination of cranky old locales and stoked millennials on the rock, but the overall vibe hearkens back to a bypassed era where "no whining" was an expected mantra for all climbers. Expert climbers and intermediates looking to push their limits are going to love Eldo. Newer climbers following a strong leader can learn a lot hear, not just from the challenging climbing but also for the challenging belays (a lot of routes are run out of feature less-than-bomber protection options). 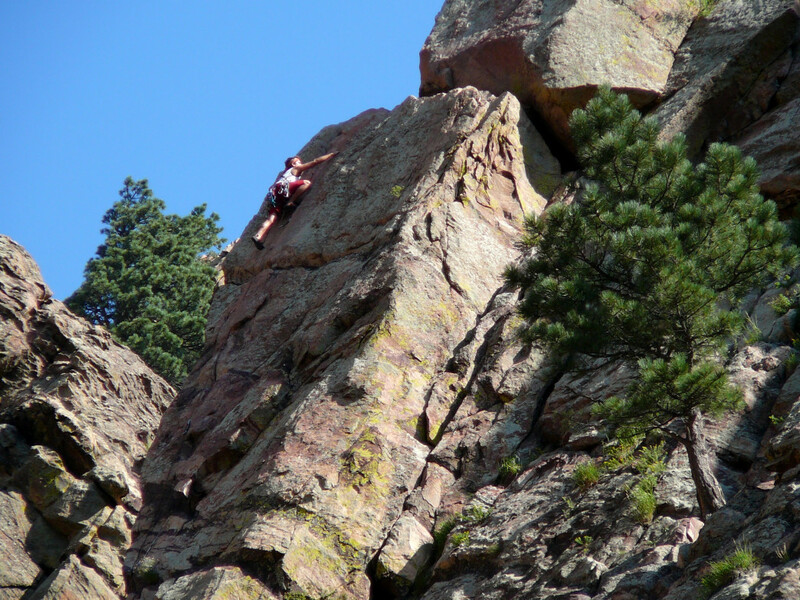 One thing is true: if you can climb well in Eldo, you'll crush it anywhere else in Colorado. Many experienced climbers have spent decades at Eldo and still feel like they've only scratched the surface of what the walls have to offer. There are also over 100 established bouldering problems (you can read more on Mountain Project here), which make this area versatile for those looking to master their moves. Yes, the bouldering is just as burly as the rock routes. From Mountainproject.com—From Boulder, take CO Hwy 93 (Broadway) South until you get to the first stop light after leaving Boulder. This is Eldorado Springs Dr. Take this West until you hit the town. The park entrance is at the end of the dirt road into town. Pay entry fee per vehicle to park or walk-in for less. You WILL be ticketed if you park in undesignated spots outside of the park.... The Eldorado Springs bottling company is right off the road to the park. You used to be able to get a free fill-up on your water bottle, but now it's a pay deal. What a rip, man.